Charles Paris (a.k.a. 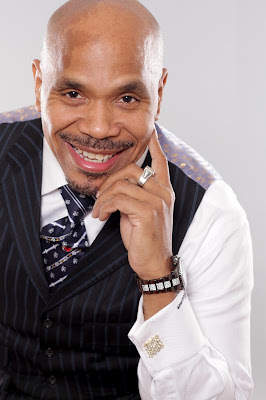 Mr. OTG), owner of Over Time Grind Productions, LLC., an entertainment company and record label, continues to make his mark not only as an astounding record producer but also as a successful tech in the technology field. As a producer, Mr. OTG has worked with a multitude of major recording artist, as well as numerous Grammy-winning writers and producers. Being a native of Champaign, Illinois who now resides in Philadelphia, it was evident that the music game chose him as he followed his heart and believed in his vision. 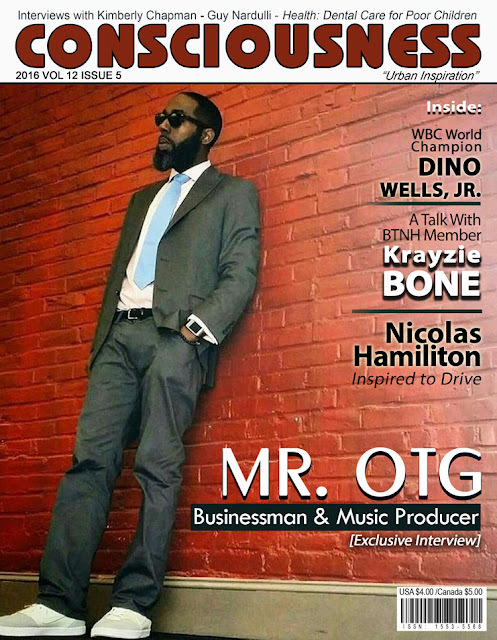 I, Consciousness Magazine had the opportunity to interview Mr. OTG. 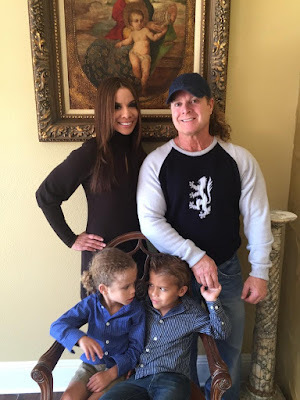 He shares some valuable and priceless information concerning how he overcame countless struggles and obstacles to position himself as a successful businessman. He also shares with the readers how he created the worldwide App, Overtime Grind, and how he continues to give-back to uplift his community. Aaron Robinson: What was your inspiration to want to produce music? Mr. OTG: My inspiration was that I wanted to create a sound and a skill for the Midwest that I felt didn’t exist. I started back in 2002. At the time it was heavily [music from the] East Coast and the South. I felt that the Midwest had a sound that just wasn’t being public and I wanted to make that sound. I got into it just by buying nice cars and putting rims on them and putting in sound systems. At the time, we would do bass competitions and there weren’t any songs of the popular music that was out that had bass that sounded good. I could play Twista and stuff like that and it would work, so my idea was why not do an updated sound of that. That’s where it all started. I started to make songs that hit good in the car. Aaron: You’re signed to MC Lyte’s production company. Besides her, who are some of the individuals in which you have had the opportunity to work with in the past? Mr. OTG: I’m the first producer she ever signed, so I got a lifetime publishing deal with her. They still place my music on TV. Now TV wise…industry wise, I had many placements on TV: VH1, Love and Hip Hop…all of the big major shows. Music wise, I‘ve worked with Tone Trump, Rakewon the Chef, Beanie Sigel, Rsonist from The Heatmakerz, 2Chains, Fred the Godson, Carvin and Ivan and China Black. There are so many people. I’ve also worked with Dice Raw from The Roots. Aaron: What was your influence? Mr. OTG: My influence…I started as a producer. What kind of boosted me more was my ear for music. It’s not so much the music that I’ve created, but more-so my ability to sit in the studio and help others generate better song ideas and arrangements. Aaron: You have come a long way in the music industry. What are some of the challenges or obstacles that an upcoming producer may endure or face while making a name for themselves? Mr. OTG: The biggest challenges that you’re going to face in this market now…the market is flooded. I luckily grew up before the social media market. I had a lot of street connections: I built the old wave first. By the time my name started catching buzz was in 2013, 2014. This was outside production. A lot of challenges that a lot of producers face is that they look to make money too fast. Music doesn’t make money anymore the traditional way that it use to. CD’s aren’t selling for $24.99, $19.99, $9.99 and $10 for streaming services. No one is actually getting a physical copy to open and say, “This producer made this beat, this producer made that beat.” It’s not the same. The biggest thing is to find an artist that you can work with and try to build yourself a brand to make money to maintain, until you find the right guy who likes your music. You have to expand and not just be a producer or else you won’t stay afloat. When you produce you just have to have some other kind of way to make money in this music business until you get ahead. I’ve worked with Tone Trump for 6 years. That’s been a gift and a curse, a lot of people didn’t want to work with me because I worked with him and I meet a lot of people who have wanted to work with us, but you have to pick a side and stick with that side. Also, do not give up and do not be afraid to sell your beats for $20 or $30 until you get to a point where you can sell them for $10,000 or $20,000. Aaron: When you look back over the course of your career, what do you think has caused you to come this far, being the successful individual that you are today? Mr. OTG: Not just television. It’s fate. My grandmother and mama prayed over me. I think I have a supreme faith just to know that’s its going to be okay tomorrow. I’ll spend all of my money today and not going to have a dime to eat tonight, but I know tomorrow it’s going to be alright. I think that’s been my biggest hope to what I’m doing is just trusting my gut and having faith that it’s going to work out. Some days it’s scary but that’s been the biggest thing as I look back on it. In the moment it was just fate; it felt right; it seemed right, and that’s what I did. Aaron: You are the owner of Over Time Grind and you also have a mobile App out called Digital Kingpins. Briefly, would you like to tell the readers a little about this amazing App that you created? 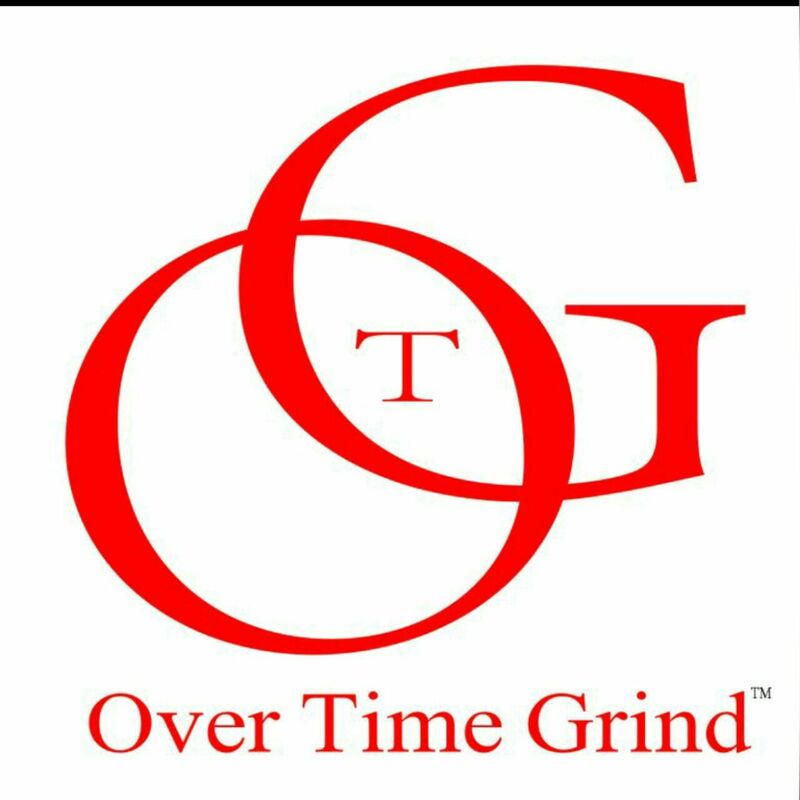 Mr. OTG: I’m the owner of Over Time Grind Productions, LLC. We are a local entertainment company and record label in Philadelphia. I started the Digital Kingpin App first but I no longer have the Digital Kingpin App. We decided to integrate everything into the Over Time Grind App. The Over Time Grind App houses music, sports, news, and videos. It has artist; it has free beats on there for singers and different people who are trying to get in the industry. It also has books. One of the best books I have on there is the Artist Bible. It has probably 400 of the best independent articles to help musician’s producers get into the business of music and how to make their own steps. Basically, it’s my contribution back to guys trying to get into the game and want to find a way in. We also sell services through the App. The main key of the App is the book, video and the music sections. We are the only App in the Mobile App market that can have new albums and stream these albums without having [customers] pay for them. Being a black man in the tech field and negotiating certain contracts and licenses, I’m very proud of myself to get the licenses to be able to provide these resources without having [customers] pay. I paid $300 for the Artist Bible to be able to be put inside my App and have it available for readers and guys who can’t pay that amount of money. Access to that means a lot to me. Aaron: You have overcome many obstacles in your past, what advice would you share with young African American males who have struggles overcoming their current situation and don’t believe there is any way out? Mr. OTG: I believe honestly that we are original men and our women has traded and created everything that is living and walking on this earth. What we have to do as black men is have that sense of pride that we have every day - the sense of creativity and all of these things. We first have to understand why we have these things, because we were the first people on this planet. When you come from a system of ownership, you don’t understand the system of how money and different things work. Have knowledge of self, don’t devour yourself and sell yourself short. I turned down lots and lots of contracts and took the long road. Realigning myself with bigger companies doesn’t help me as a black man get into the field that I’m trying to be in. My first key is to know yourself, know where you came from, know who you are and know what you bring to the planet. What we bring to the planet is everything that’s entertainment and creativity. So with that, everything has a value. Place a value on yourself. Once you value yourself, just keep going. Once you understand your value, you have to understand why people want to get that from you. There were times that I didn’t have food. There were times that my lights were cut off. Last year, my biggest turn of events is when I spent most of my summer without lights, because I was investing into the Apps. I understand that I have a key in social media, so that’s about 122,000 Philadelphians. I know that there is no other company that can tie into 20 or 18 year olders to 35 year old demographics. They can get into the white demographics; they can get into the college demographics, but they can’t get into urban black demographics. That’s my value and I protect it. That’s how I’ve been able to grow as a business. Black people are not properly educated in a system that we didn’t build. We didn’t build the system of finance, that’s a Jewish built system. Not taking away from them guys, that’s just the system that they are great in…Germans, Europeans, and the banking system. We didn’t build that system, so of course we are going to struggle in finance, when that’s not where we’re good at. Black people, we came from a system of freedom, we’re Africans. We came from a system where we owned all the gold and all of the natural resources. We owned everything. Aaron: You seem to be a passionate person about life, your people and your community. Where does your inspiration come from? Mr. OTG: I came from a po family, not a poor family. Half of my family is middle-class. My mom is a professor at TWU. I grew up in low end housing, low income housing and single mother housing. Growing up, my mom was kind of not a big TV person; she just watched the news. She talked to me a lot as I started getting in trouble very young. I always have been a guy who questioned the system. In class I would question why when they were telling us about Black History – none of the slaves revolted. I knew if there were 500 of my friends picking cotton, and then it’s ten white guys on horses, we are going to try to get them. So [in class] I would always get in trouble. I always thought outside of the box and questioned things that weren’t necessarily supposed to be questioned. As I got older, I just started looking for those answers and I started feeling like, honestly coming from Champaign, that I lived from a place where nobody cared. I lived from a place where they forgot about us when they talked about the East Coast, the West Coast, or about laws or new laws being passed. They were not talking about Champaign, Illinois. They are talking about New York City, Philadelphia, Miami, Los Angeles and/or Texas. They are not talking about the middle of the map. As I started going through high school, I started seeing guys getting arrested, going to jail for a very long time and I just witnessed my friends going through stuff. I felt like somebody needed to say something. I wasn’t attached to anything; I’ve always been a loner. I was never really the coolest guy but I got along with everybody. I felt like I didn’t have anything to lose. I started seeing the gangs becoming a problem and the gangs killing people. I started to realize that all the OG’s are locked up. They can’t talk to the young people; the young people are doing what they think is cool. Aaron: Is this the reason you built Over Time Grind? Aaron: Would you say this is your goal? Mr. OTG: That’s really my goal because I remembered feeling helpless and nobody cared. I remember working in the factory. When the recession came they took my job and I showed up to work every day and did everything that I was supposed to do. I remember feeling helpless and I remember feeling like I was not going to feel like that anymore, so I’m going to do what I know what I do every single day and that’s work on cars, make beats, go in the studio and try to help kids out in the neighborhood. I’m going to turn that into a business and that’s what I did. 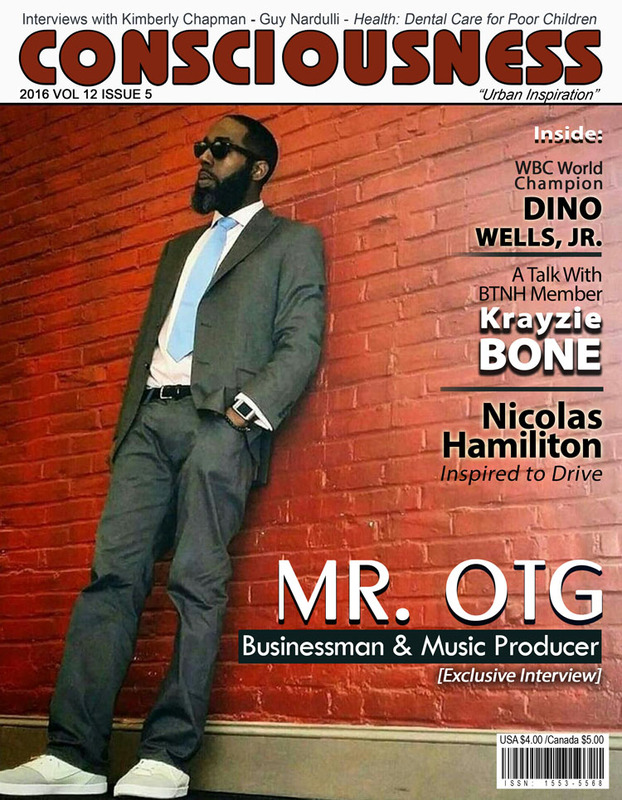 Mr. OTG: I just would like to say I appreciate all the people who will read my interview in the magazine. I appreciate you for putting out a magazine that talks about these things and who isn’t afraid to push the limit and talk to black entrepreneurs, traditional and non-traditional. I’m a non-traditional entrepreneur. 90% of the time you won’t catch me in a suit or tie. Most of the time you might catch me looking like a regular guy. I appreciate the opportunity to have a knowledgeable interview with you. Thank you!